Description: Gosu was a hobby site centering around nerd culture (gaming, movies, books, comics, tv, etc) that I created initially in 2010 using WordPress as a CMS and a custom theme built completely from scratch. It utilized a few custom back end features including periodically implemented custom taxonomies/content types and several plugins. 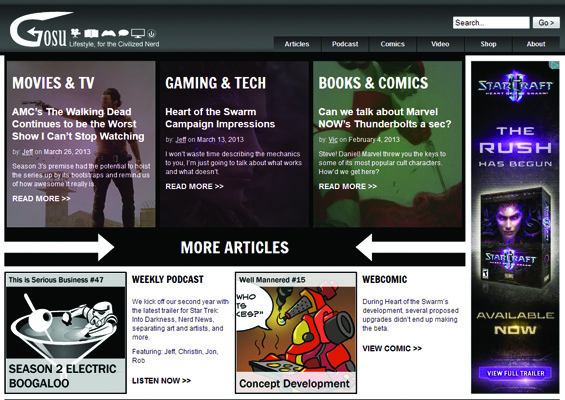 Its content included articles, weekly podcasts, and webcomics. I also managed several contributors, each with their own user accounts with specifically managed roles and permissions. I retired the site around the end of 2013, but the podcast continued for another year at http://tisbcast.com.